AAAAAAAAA, ASGORE LOOKS EVIL, HOW COULD YOU DO THIS TO THE PRECIOUS CINAMON ROLL? 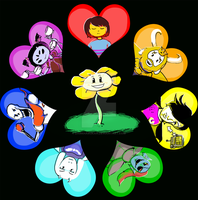 Why has noone drawn Asgore's actual design instead of the silhouette, yet? Well, the game came out not that long ago, so I think people like him so much, they really don't wanna spoil how he actually looks like to anyone. At least, that's what I think.